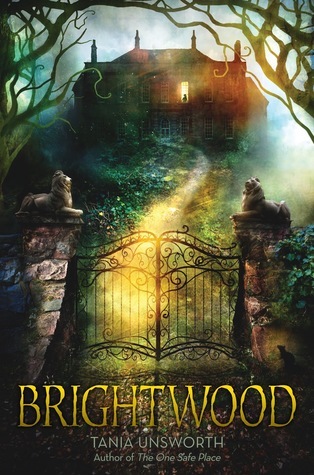 author encounters – hello library! So, for those of you who are not nerds, Aaron Allston is the author of a number of Star Wars novels – actually, he’s the author of all the good Star Wars novels (other than the ones written by Matthew Stover and Timothy Zahn, and maybe Michael Stackpole if I’m feeling generous). He’s awesome. 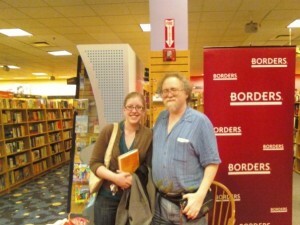 So when I found out he’d be doing a book signing at the Oakbrook Borders, I knew I had to be there. It was a pretty awesome scene: there were lots of people in costume, and a remote-controlled life-sized R2-D2. Most importantly, of course, there was Aaron Allston, who read some from Outcast (his new book, part of the new Fate of the Jedi series, which is liable to be pretty terrible but that’s not his fault) and then answered audience questions…including mine, which I’ll tell you about if you’re curious. Afterwards, we all lined up and got our books signed. He was really great and personable and happy to answer questions and chat a little. He wrote a personal note in everyone’s books. He even agreed to sign one kid’s stack of like eight books, which is unusual at these events. So that was all pretty cool, but then it got awesome. Earlier in the evening, I’d been talking to some guys from the local Star Wars club, and they’d invited me to go out to dinner with their group after the signing. I was hungry – I’m always hungry – so I went, not knowing that – drumroll, please – Aaron Allston would be joining them. For the record, I never wake up in the morning and think to myself, “Hey, I bet I’m going to have dinner with one of my favorite authors tonight.” Because that is not a thing that happens. Except for tonight, when it totally did happen. So anyway, we went to some sports bar-type place and had dinner and a drink with Aaron Allston, seriously, and we talked about Star Wars and lots of other stuff, like normal people, which we mostly are. It was an epically awesome night…which most of you know since I’m pretty sure I called everyone who could possibly care once I got home. 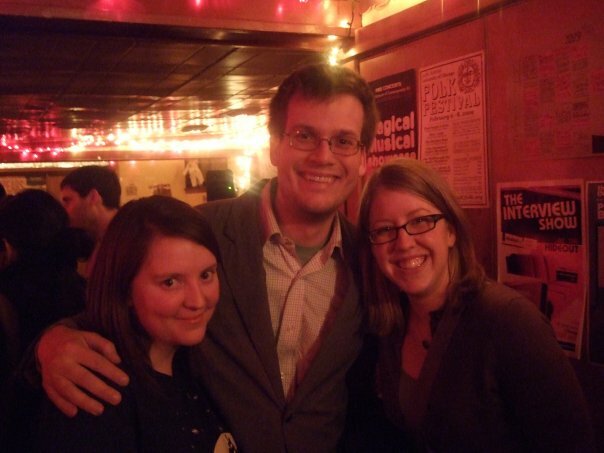 So, several days ago on John Green’s blog, we noticed that he would be taking part in The Interview Show at The Hideout, one of my fave Chicago bars – and that he was offering to buy any librarian who showed up a drink. Well, I like free drinks, and I like The Hideout, and my boyfriend had a passing interest in hearing what Tom Geoghegan (one of the guys running for Rahm Emmanuel’s seat, and another Bazer interviewee) had to say. So we figured we would trek down there (The Hideout is the most mysteriously located bar ever) and see what was up. The interview was great – of all the folks on the show, Green was the funniest and at least appeared to be the least uncomfortable. If you’d like to watch the interview, it’ll be posted on YouTube in the near future. After the show, N and I met up with one of my co-workers and her boyfriend, and (after asking John what the deal was) we promptly cashed in on our free drinks. We then decided that we really needed a picture with him, so we did that, and then lapsed into conversation. He shared a great anecdote about Looking for Alaska that probably isn’t appropriate for this blog, but if you’re curious I’m happy to fill you in. As my co-worker said, anyone who would buy drinks for librarians has to be a good person. There’s also a lot to be said for an author who’ll have a candid, random chat with you at a bar, and who can talk about his books without sounding either awkward or pretentious. I was very impressed by John Green. * I found out later that one of my sisters is actually friends with John’s wife from college, which adds a whole other level of weird to this story. Today I went to see Stephen Chbosky read The Perks of Being a Wallflower at a bookstore down the street from my house. It is probably the best thing I have been to, reading-wise, and I’ve been to a lot of readings by a lot of authors I like. But the thing is, he is exactly as nice as you’d think he would be, given he wrote that book, and he talked to everybody who brought books to be signed, and when he saw mine he laughed and said, “Wow, this has been thumbed. You’ve read this a lot.” And he flipped through to look at the things that I’d dog-eared and marked and written in the margins about, and it was really cool. 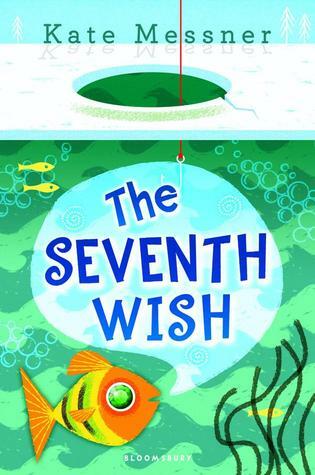 Before it was published, he’d given a xeroxed manuscript of the book to a friend, who read it on an airplane on the way to a birthday party for a girl he knew, who was rich and beautiful. He was neither – instead, he was chubby, with a tendency toward dating really terrible women. And he read that line, and it really struck him. And he’d liked this woman for a while, and that line made him decide to pursue her, because she was the kind of woman he wanted, and he decided to deserve her. And he did, and they got married, and afterward he gave her the manuscript and told her that it was the reason he’d had the courage to go after her. And she read it, and loved it, and called up a guy she knew who worked at MTV and was trying to start a book publishing branch. And he read it, and he loved it. And then he published it. And that’s why we’ve read it. He was really nice, and really funny, and he looked about a decade younger than he is. And some of the people he’d gone to high school with were in the audience because they live in Chicago now. So I’m really glad I went. It makes the book even better, somehow, knowing that the person who wrote it actually meant it, and is actually as nice as someone who writes this should be, and seems to really appreciate and understand how much it means to people. Anyway, I guess that’s a pitch for this book. 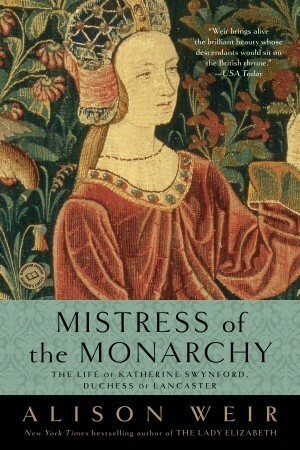 But it’s a book I feel pretty good about pitching.